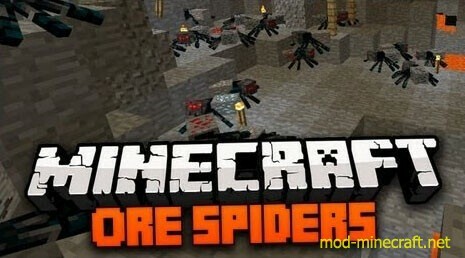 Ore Spiders Mod adds 11 new spiders to the game, most of the spiders match up with an ore currently in the game, and they drop that item when killed. This should make cave exploring a tiny bit more exciting. The Coal Spider spawns pretty much everywhere, like the coal ore does. The Ender Spider, spawns ONLY in the End, as I thought it would be too difficult to be the over-world. However, I MAY change it if people request. 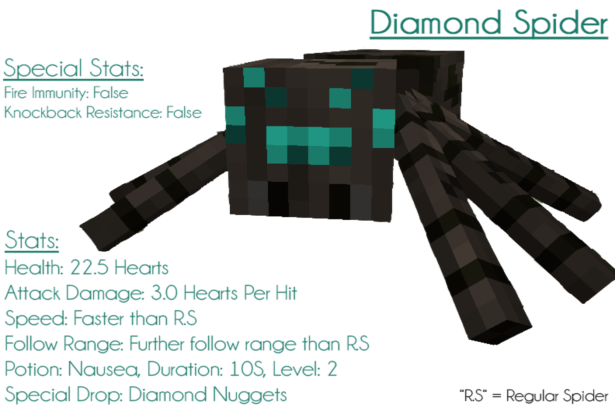 The Nether-Quartz Spider only spawns in the Nether. 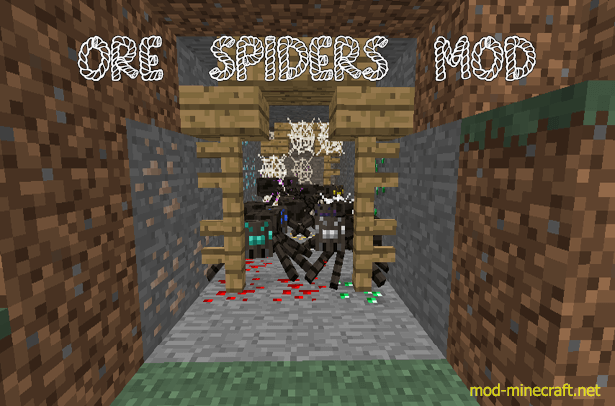 The Obsidian Spider spawns CLOSE to obsidian, usually within a 8x8x8 cube of obsidian. They are quite rare because of this spawning condition. 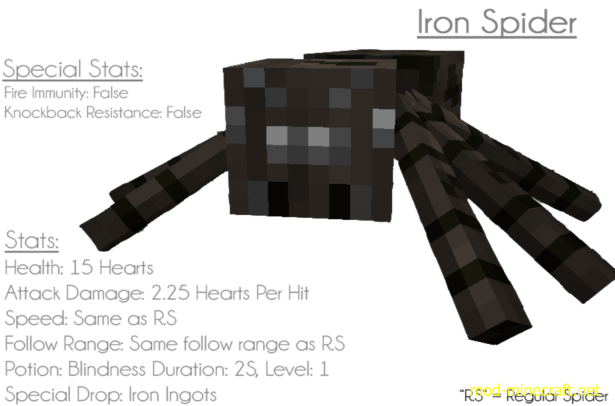 Every Spider has 1/2 chance of dropping their respective drop, as long as they die by the players sword. I.E. 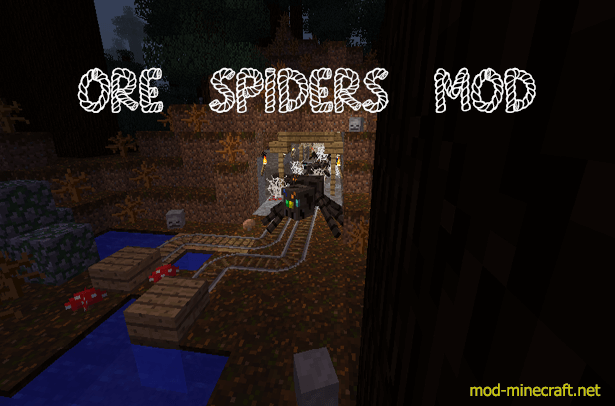 If the Spider dies by fire/lava it will not drop ANYTHING – As requested by the guy who gave the idea for the mod. 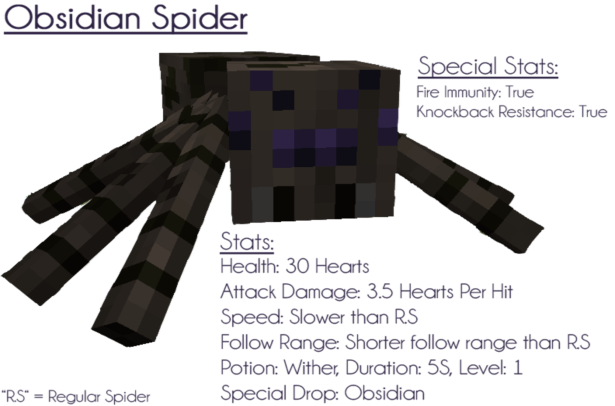 If the Spider the dies by a sword with looting, it still has a 1/2 chance of dropping, but it will drop significantly more. 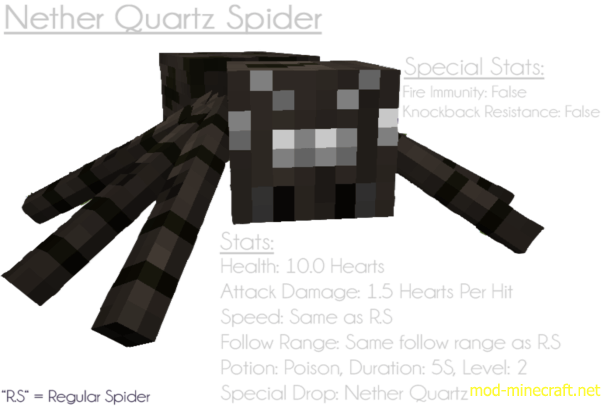 Queen Spider Eye: This eye is used to create a Mysterious Potion. Mysterious Potion: Create this potion in order to summon the spider queen. Orb Weaver: The only way to get this item is to kill a spider queen. Upon clicking, the orb weaver will throw a orb out that when in contact with a block, will summon a cobweb.